1 Delicious food doesn’t have to be complicated to make. Take this dish as an example. This pasta recipe is fast and easy to do. 2 First, grab a pan and get it nice and hot over medium high heat. Pour olive oil and butter and throw in your garlic. Cook this until it is brown before adding the shrimps, chorizo and Knorr Chicken Cube. 3 When the shrimps and chorizo are cooked through, mix in the mushrooms, siling labuyo, and noodles. Toss this well and top with parsley and parmesan before serving. 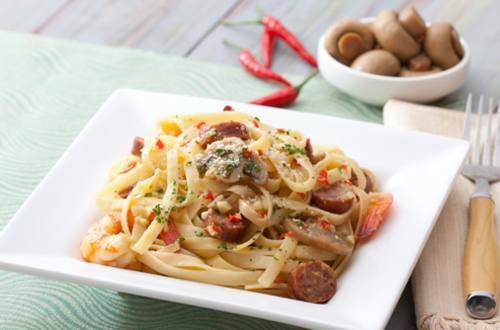 4 When you serve this Spanish-inspired pasta dish to your family, they will surely be left speechless.